Internet : absolute communication, absolute isolation. 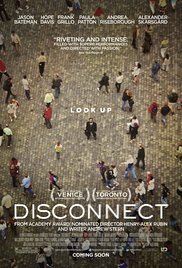 A great movie with a subject that fits a modern society nowadays and really fascinated me. Because of my professional life I’m closely connected with the used themes and technologies, making it more enjoyable for me. At first I was expecting a boring movie about the contemporary information society with a lot of posturing and dialogues, so the entertainment value of this film would drop to absolute zero. This was in retrospect a huge judgmental error. This was an intriguing movie with three story lines that eventually were subtly interwoven. The thread is a socially critical message with three examples of what dangers lurk in today’s information technology : exploitation, internet fraud and cyber bullying. Today it’s reported regularly on the news and that makes this film more realistic. It can happen to anyone what these people go through. The three stories were very realistic, and I didn’t think it was over dramatized or corny on an emotion scale. There is a double message in this film in my opinion. On the one hand there’s the warning that not everything has to be taken for granted. There is indeed a risk that your financial information is suppressed and your bank account or credit card could be plundered. Cyber-bullying can go that far that it could drive a person to perform an act of desperation. And there are an awful lot of people/youth on the worldwide web who are abused/used by individuals with the sole purpose to enrich themselves. On the other hand, I think the real message behind this cinematographic gem is the fact that people never been so connected to each other by means of technology (email, facebook, twitter, blogs, iPhone, iPad, Internet TV. ..) as today, but in real life we have never lived past each other more and alienated from one another. The acting was superb. Each character was well-chosen and fitted perfectly into the storyline: the schoolmates who went from mischievous to compassionate, an outsider in his friendless isolated world, the lawyer who is more involved in his work than his immediate family, a freelance cyber detective who did not notice the feeling of guilt his son was struggling with, a couple that stopped communicating with each other and try to deal with emotional problems on their own without engaging the partner, the young man whose life takes place in front of a webcam and not in real life and the journalist who eventually wants to play the role of Mother Teresa. At times brilliant performances and poignant self discoveries of the characters. The slow motion scenes at the end were visually strong. The movie has a happy end so everything turns out just fine. So it’s a strong movie with deep realistic situations and pure convincing acting with a sad message. However, it ends ultimately with a glimmer of hope. Just whan´t to say that I really like your blog. It really made me happy reading you like it.